well, my day has sucked so far. was driving up to san luis obispo this morning, to go see my kid play baseball. got as far as the big hill on the 101 heading down into camarillo and blew a tire. little tiny shoulder. crawled out on the passenger side. people insanely speeding down the hill. thank goodness for the aaa guy. don't envy his job changing the driver side front tire with all those "sweet" drivers barrelling down that hill. found a tire place in camarillo and got a whole new set – had over 78,000 miles on the original tires, so it was probably time anyway. anyway, got that done and no way was i going to make it to the kid's game at all, so with assurances that he was going to have a ride home, i turned around, and here i am playing with my pictures. was too late to even drive out to some car show in ventura, though a very nice old woody did pass me while i was stuck on that hill. hubby has taken his mother and nephew out to disneyland for the evening, so i'm blasting some music and getting sleepy at the same time. enough of my busy day. 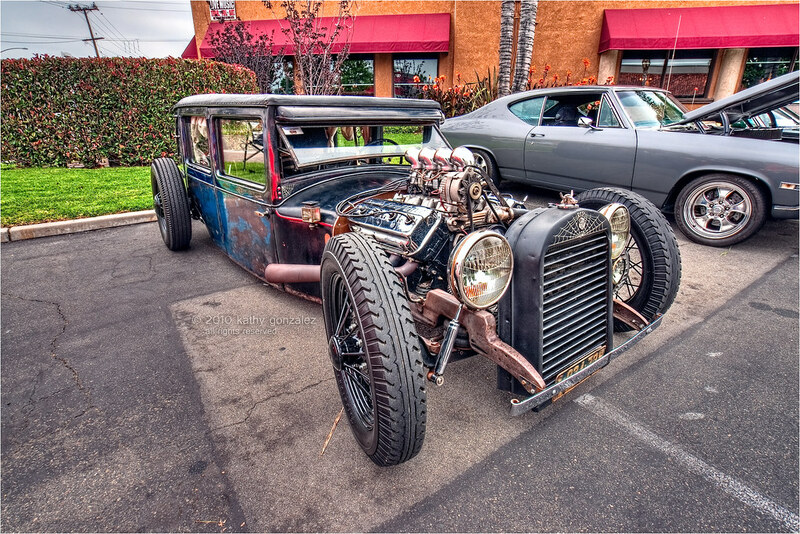 you're really here for a picture, so here's an interesting hot rod. caught it just before the owner drove off...he was going home to fetch some other car for the show here in tustin. here's what's left of a 1928 essex super six somewhere under this customization. the spider web detail seems a little unnecessary, but i do like the bull's head hood ornament.